A lovely alternative to the Unity Candle Ceremony, especially if your wedding takes place on the beach, the Sand Ceremony also embraces the symbolism of “two shall become one.” As part of the exchanging of the vows, it’s a great way to break up readings and also leave with a keepsake of the big day. What is a “Wedding Sand Ceremony”? Before we dive into what you need and what type of readings, songs or vows coincide with a sand ceremony, let’s talk about what it is! Both of these ceremonies are symbolic of what marriage is; two people coming together as one. And just like the unity candle ceremony, where both the bride and the groom bring for forth fire and light a candle together, both partners will participate in a sand ceremony too. Performed after the vows, couples may scoop a bit of sand near their feet and pour it into a lovely bottle of choice which then becomes a lifetime keepsake. Seashells can be used for pouring if you wish! Or you can have glass bottles filled with personalized colored sand representative of each individual. There’s a bit of a debate when it comes to where the wedding Sand Ceremony originated. Some argue that it was in Hawaii others believe it may be rooted in Hebrew culture, specifcally the Salt Covenant which was once used to seal friendships and other agreements. Two men would carry pouches filled with salt and at the binding of the commitment – whatever it may be – they’d blend salt into the ground together. The symbolic ritural has grown and transformed throuhgout the year, and now the inspiration is used throughout beautiful ceremonies everywhere. As mentioned before, it’s actually quite simple. Essentially, each partner will bring their own sand to the “table” and pour their respective vials or seashells full into the new piece. 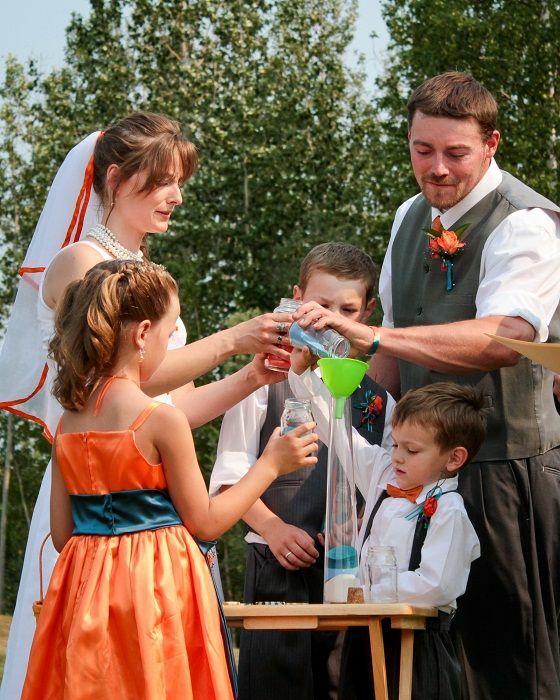 Sometimes, if you’re blending families, the children will also take part in the ceremony as well. 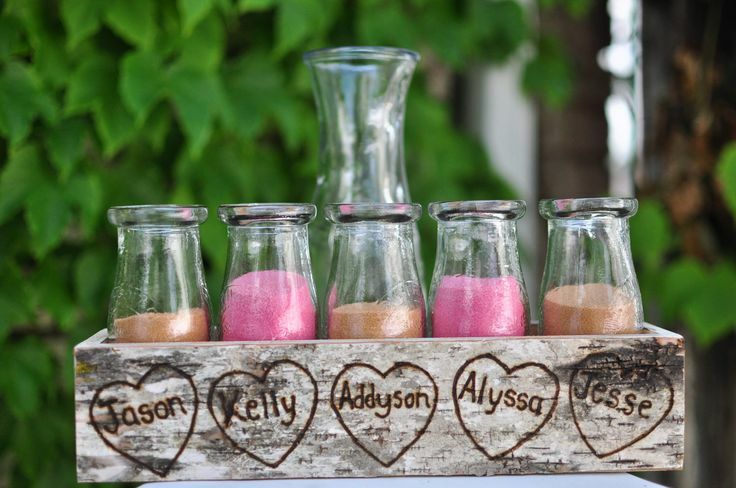 It’s a great idea if you choose to go with various color sands so all of the guests can attach visual memories to the symbol of the family’s blend. Of course, you’ll have to prepare and buy a few extra things if you plan on adding a Sand Ceremony to your vow exchange. Allow us to help you not miss a beat – or grain of sand. Various sands, glass vials or vases, and seashells too if you’d like, there isn’t an extra large checklist when it comes to shopping around for the right pieces. There are several ways to incorporate the Sand Ceremony into your vows or readings. From taking a music break and having an instrumental song play as your pour the sand or having your minister bless the bottles before you pour, we’ve got a bit of inspiration for you. The Apache Wedding Prayer is one of the more popular readings when it comes to sand ceremonies. And it’s one that the minister can bless the bottles beforehand as well as slipping a written version of the prayer (this can happen with any other reading you decide to use) into the bottle before the sand goes inside. Officiant: (Name) and (Name) as you pour your sand into the one container, please repeat after me: “As these grains of sand merge together as one, I merge my life with yours. Please take my love throughout the sands of time. My heart is forever in your keeping.